Wing span: 1 1/2 - 2 1/4 inches (3.8 - 5.7 cm). 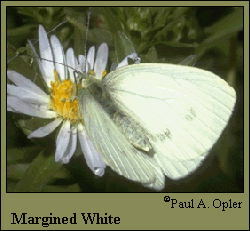 Identification: Summer form is pure white above and below; spring form has black-tipped upper forewing. Underside of hindwing and apex of forewing have veins edged with yellow-green or gray-green. Life history: Males patrol for receptive females. Eggs are laid singly on underside of host plant leaves on which the caterpillars feed. Chrysalis hibernates. Flight: Two flights from February-September in the West. Caterpillar hosts: Various native plants in the mustard (Brassicaceae) family. Adult food: Nectar from flowers of the mustard family and other plants. Habitat: Forests, meadows, deciduous woods, streamsides. Range: Southern British Columbia and Alberta south to central California and southern New Mexico; east to eastern Wyoming and eastern Colorado. Management needs: Study effects of logging and grazing.